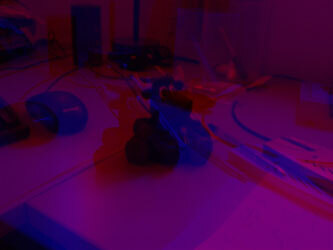 Stereoscopic and Anaglyph - M.I.L. Team - 3D+ and more.. Here we will analyze in a simple way what is anaglyph 3D and how the 3D glasses are processing. "..Anaglyph 3D is the name given to the stereoscopic 3D effect achieved by means of encoding each eye's image using filters of different (usually chromatically opposite) colors, typically red and cyan. Anaglyph 3D images contain two differently filtered colored images, one for each eye. When viewed through the "color-coded" "anaglyph glasses", each of the two images reaches the eye it's intended for, revealing an integrated stereoscopic image..."
In order to keep the article simple and not be too technical, keep in mind the way that digital photos are processed by PC's, Digital Cameras, Phones, Tablets, etc... Every simple pixel of the photo corresponds to one and only color. Each color, can be described by using 3 different numbers. The Red component (R channel), the Green component (G channel) and the Blue component (B chanell). Each number can be an interger number, from 0 to 255 max. If you remember some simple maths from your high-school, you will easily calculate that digital pc's can describe 256 x 256 x 256 = 16.777.216 different colors. For example, a photo that is completely black, has every pixel with the value of 0, e.g. (R,G,B) = (0,0,0). On the opposite a completely white photo, has every pixel with the value of 255, e.g. (R,G,B) = (255,255,255). A completely red photo, has each pixel with the value of red = 255 and blue and white channel values equals to zero. Thus, each pixel will have the value (R,G,B) = (255,0,0) respectively. 1. A pair of red-blue glasses. As described by the definition, the red component filters out everything that the specific eye sees, and lets only the red color of the view to pass into our eye. So, the left eye will see only the Red Component of the view. On the other hand, the blue component of the glasses, filters out everything that the other eye sees, and lets only the blue color of the view to pass into to the right eye. So, the right eye will see only the Blue Component of the view we see. Remember when we talk about the two different views that our eyes collected? Each eye is capturing a different perspective. So, if we take the two different eye views, exclude all color except the blue and the red component for each eye separately, and combine them back, we will produvce one final photo. In this final photo our brain will summarize two different chroma views into one but from different perspectives. So, a photo with depth inside (a 3rd dimension) will be added to the final view! 4. A 3D photo from the above two views combined into one!